The first thing I knew I had to do was to take the hull back to the wood. 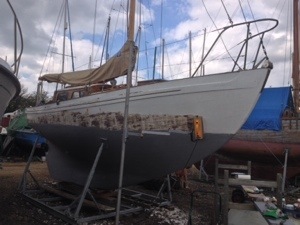 The keel and hull below the waterline were easy: because Drumler is made of Teak, I was able to sandblast the iron keel, and also the hull up to the waterline. 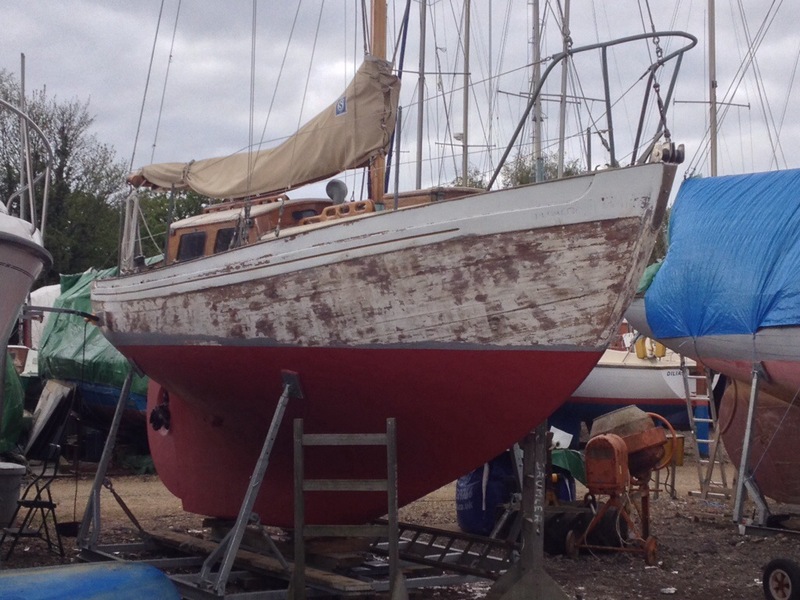 On the left you can see the keel has already been sandblasted. This still left me the topsides to deal with – still a sizeable job. 1. Chemical paint removers: this looked messy and it wasn’t clear anyway how effective it would be. There was one product that used a combination of chemicals and some sort of paper strips, which looked less messy and more effective, called Peel Away made by Dumond. I contacted them but it turns out they don’t distribute in the UK. So – back to the drawing board. I borrowed a scaffold pole from the boatyard, attached it to a patio umbrella base that I have at home, and then attached the lever arm to the scaffold pole. You can see the scaffold pole on the left, with the lever arm extended away from it. This set up meant I didn’t have to hold the heater all the time, which made the work considerably easier. For thick layers, I found I had to position the heatlamp twice over the same area: once to get the topcoats of gloss off; and then another time to get of any residual undercoats. The best thing about it was that I could leave it on the lever arm heating up paint while I got on with other things – eg. 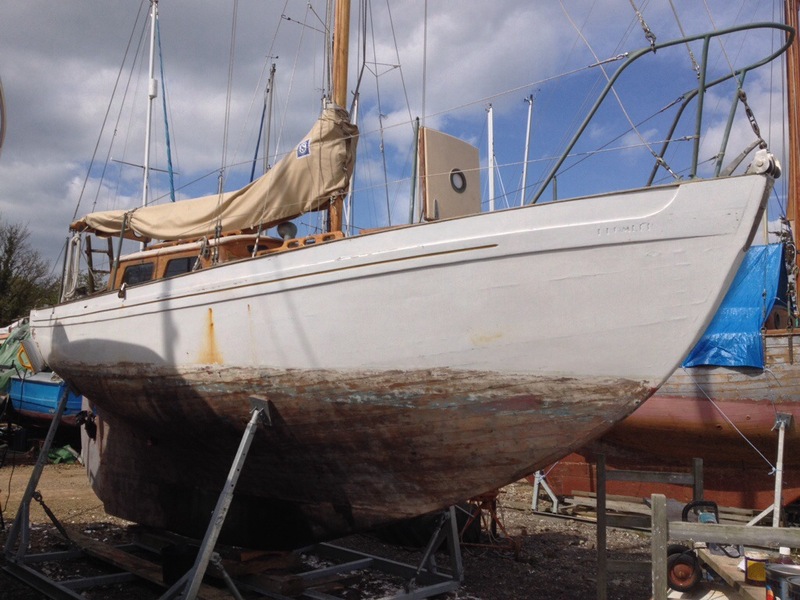 sanding and painting – and then dash back to scrape the heated paint off. Then I would move it along to another patch, dash off and do more painting, etc until that patch was hot enough to scrape. It basically took me about a day and a half per side to completely strip the paint off. 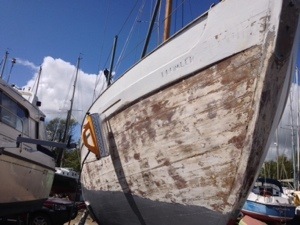 In these pictures, you can see I have already primed the hull to the waterline – that bit was easy because it had been sandblasted so only needed a bit of sanding down. 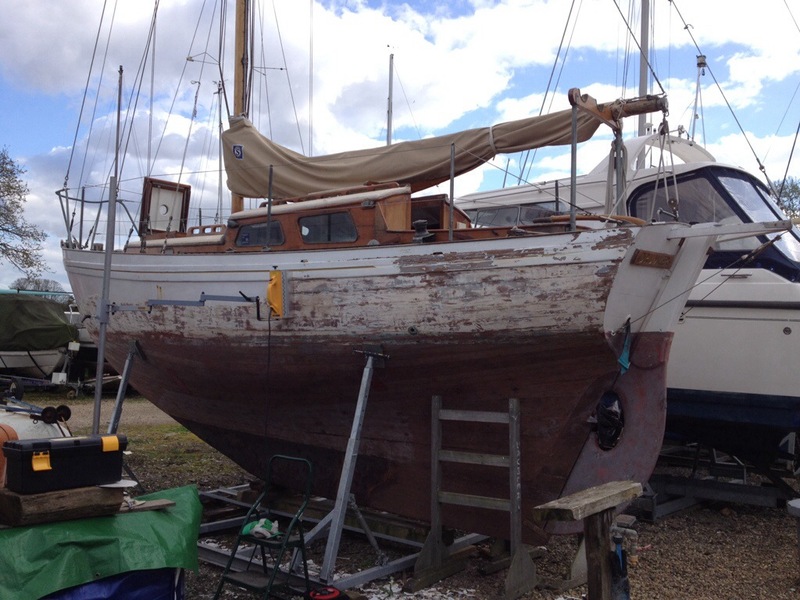 So, all in all, the paint stripping was not too hard; I would definitely recommend the Speed Heater to anyone with a wooden boat. The main drawback is that it’s a bit expensive, so if that’s all you’re going to use it for, then if might be best simply to rent one for several days. 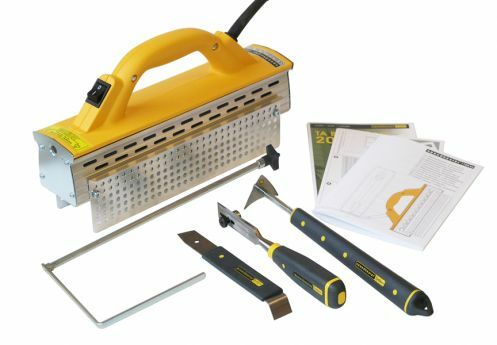 The UK distributor does do rentals but if you live in Suffolk and you want to rent mine, get in touch! Nice tight seams under all that paint!